Chile Ancho is a mild, sweet-tasting variety of a dried ripened poblano chilli. 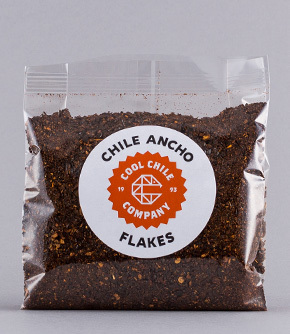 Our chewy, nugget-like flakes are made from deseeded and diced whole ancho chillies. Wrinkly-skinned ancho chillies are the most commonly used dried chilli in México with a fruity, earthy flavour that’s indispensable whether you’re making salsas, sauces or stews. Add to dressings, sprinkle over salads, or mix into chocolate batters to give your baking a subtly spiced kick. Lightly toast ancho chilli flakes in a dry pan until fragrant to release their flavour or add directly to simmering stews or soups. Ancho (ahn-choh) chillies are made by drying fresh poblano chillies. Their name comes from their broad shape when dried (‘ancho’ means wide in Spanish).